One of my 2017 goals was to read more and to get through this pile of books I’ve been working on. In making this goal, I was not quite sure where I was going to find the extra time in my already packed schedule to accomplish this feat but I then realized just how much time I was wasting each night before bed on social media. I thought to myself maybe if I dedicated just 30 minutes of that wasted time each night I could finally make my way through the books on my “need to complete because I started reading it 9 months ago list”. Ruth shares her experiences with finances, juggling the chaos of life, motherhood and being a wife. While the book is generally speaking, a book about how to be frugal but still having a good life, a lot of the book focuses on other aspects of our lives that we are not giving enough attention. While using her real life examples, she provides solutions or steps for you to do your own soul searching to find ways to manage the chaos of your life more effectively. Managing said chaos will then help you achieve your financial goals and be able to do this thing called adult life a lot easier. Before reading the book I thought the book would be filled with a few good ideas here or there if I was lucky but that in all honesty I was probably not going to be dedicated enough to incorporate those ideas in to my own life. However, I was pleasantly surprised at how much I got out of this book. It’s also a super easy and quick read with some homework assignments here and there as you progress though each chapter. I like that because it made me focus on one topic at a time with a dedicated time to reflect on what I just read. Reading this book couldn’t have come at a better time because I (as a wife & Foster Mom) felt I was slowly falling down a metaphorical spiraling hole. This hole was full of a lack of organization, piles of laundry and just a chaotic and messy life in general with no clear direction, path or tangible goals in place. I was feeling lost, stressed beyond belief, and longing for a simpler way to stay ahead of all of my responsibilities in my daily life. Simplify my schedule and my overwhelming to-do list and have actually incorporated those ideas in to our day to day life. I still struggle some days with these things but I’m doing much better and am really glad I read it. What book(s) have you read that has positively impacted your chaotic adult life? 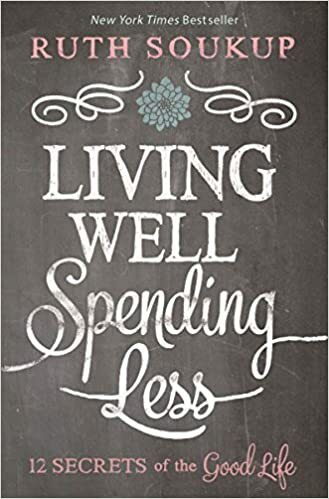 Have you read Living Well Spending Less by Ruth Soukup? What did you think of the book? Leave your thoughts, questions or comments below!